This is movie is based on the real life of Joy Mangano who went from “rags to riches” as an inventor and entrepreneur who sells her products on the television shopping networks. Jennifer Lawrence carries this movie with an outstanding performance, as she shows a wide range of emotion and understanding of her character. We meet Joy, a young struggling mother with a dysfunctional family who invents a mop with great features. She cobbles together the resources to make a model of it and convinces shopping network executive, Neil Walker (Bradley Cooper) to consider this product to be pitched on live TV. She has to borrow money and mortgage her home to have the funds to make the inventory needed to be available. 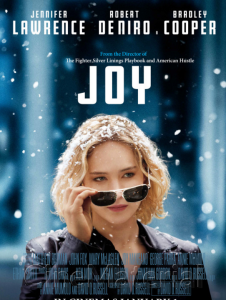 There are exciting moments about impending success but some behind-the-scenes patent and manufacturing shenanigans make it seem like bankruptcy is looming and Joy has to decide whether to give up her dream. We have not really spoiled the film for you because it is much more than this brief outline of the plot. The essence of this story is not about the outcome because this is known since it is touted as a true story. The reason that this movie will resonate with many viewers is because it shows how important childhood relationships can make a big difference in a person’s life. We see early on in the film the dysfunctional family environment, in which Joy is living. She struggles to make ends meet working during the day as an airline reservations clerk, and then moonlights helping out with the business books for her father’s (Robert Di Niro) auto parts business. She lives with her divorced mother (Virginia Madsen) who sits around all day watching soap operas. Her ex-husband, Tony (Edgar Ramirez) is a second rate singer who lives in the basement of her small house practicing his music most of the time. Along comes her father who just broke up with a girlfriend and needs a place to live, so he moves into the basement with her ex-husband. The father has a new girlfriend, Trudy (Isabella Rossellini) who has her own place but mainly hangs around in Joy’s house also. There is her young daughter, Christie (played by Aundrea and Gia Gadsby) who seems to idolize Joy. One more person lives in the house and that is the grandmother (Diane Ladd) who is actually the narrator for a good part of the film.